I've never met someone who doesn’t have a problem managing their time. We all wish there were more hours in the day! achieve a state of concentrated flow. Personal Kanban—using Kanbanfor1 as a tool—is a great way to achieve this. Kanbanfor1 has always been popular amongst IT professionals, but I soon saw how much it appealed to those working in other industries. My friend Lou co-ordinates the marketing for one of New Zealand’s biggest dating sites from a Kanban board, Emma manages her research for the national radio station with Kanbanfor1 and Brenda coordinates the funding of TV and films. In fact, over the past few years I’ve noticed that most people who attend my personal productivity courses come from industries other than IT. Kanbanfor1 can be used in all sorts of ways in all sorts of contexts—at work, and at home—to help you become more productive, and get more out of the time available to you. As well as managing workflow and tasks, some people have found Kanbanfor1 a great talking tool for one-on-one meetings. Good managers meet with their direct reports at least every couple of weeks for a one-on-one conversation—but often those meetings can feel a bit forced and be hard to start. People have told me that one-on-ones with their managers have become more relevant and focused since they’ve started bringing their personal Kanban boards to these meetings. micro-manage, so a prerequisite for successful use is a trusting relationship where this kind of transparency won’t be abused. If this sounds like your situation, try using your Kanbanfor1 board for your next one-on-one; it’s a very powerful conversation guide. One of my clients runs a major consumer website with customer service available 24/7. Customer service representatives usually work in pairs, with one person working during the day and the other at night. When a rep comes to work they need to know what cases are in the queue and what's happened during the previous shift. This used to be done with an Excel spreadsheet—that is, until the team discovered Kanbanfor1. Each pair of reps now share a board which they use alternately. At the end of each shift, upcoming work is defined in the “Things To Do” and “Next” columns. It’s then clear to the next rep what they need to work on when they first start their shift. 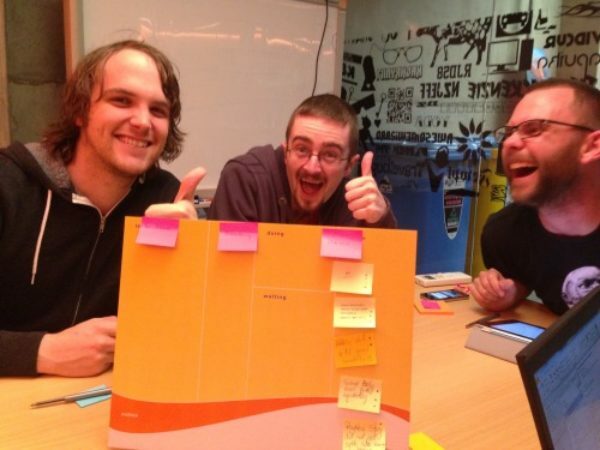 Lean Coffee is a structured, agenda-less meeting. It’s a bit like a timeboxed unconference on speed: People get together, decide on an agenda and start talking. A Lean Coffee starts with the meeting attendees populating a personal Kanban board with topics or items to discuss. This forms the agenda. They then discuss one item at a time, timeboxing the discussion of each topic. The group move a sticky-note to “Doing” and discuss the topic for an agreed amount of time (I like 3-5 minutes). Once the timebox has run out the group decide whether to keep discussing the topic. If yes, they add another timebox—if no, the group moves to the next topic. The meeting ends when the agreed time is up or when there are no more topics to discuss. 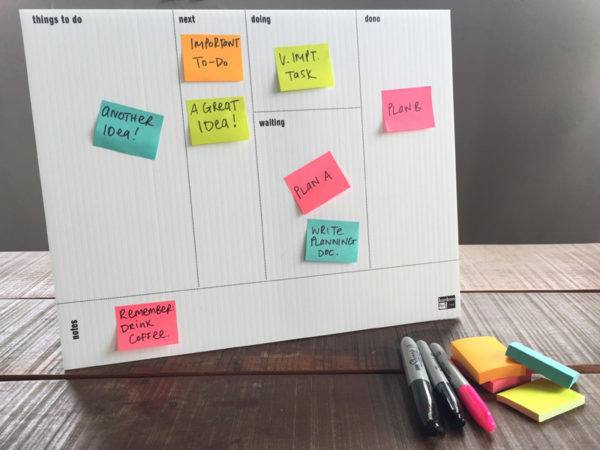 Since one of my clients have provided a Kanbanfor1 board in each of their meeting rooms, the use of the Lean coffee meeting format has sky-rocketed! If you’d like to learn more about the Lean Coffee concept check out this 2-minute video or the official Lean Coffee website. I have seen various approaches to clearing out "Done" stickies. While some people just throw them away at the end of each week, others keep them and use them as a record of what they’ve done. If you’re doing monthly reporting, it’s really helpful to refer back to your list of tasks to identify what you achieved. Or if you use colour streams for different projects or types of work, you can very quickly get an idea of the balance of your workload across different areas. 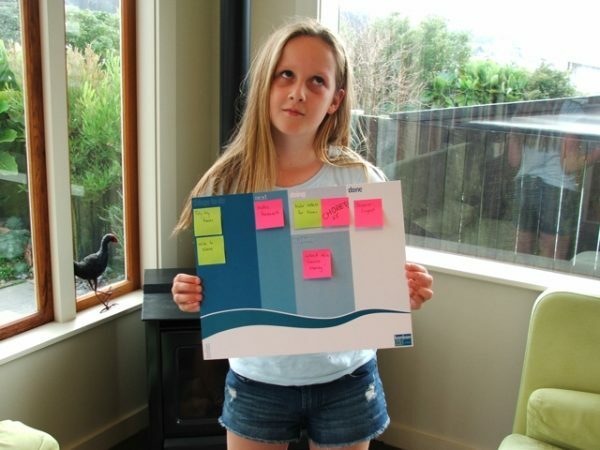 Even the kid uses Kanbanfor1 to manage her homework and chores. Most people who get into Kanbanfor1 at work love it so much that they also get a board for their private lives. I’ve seen people use Kanbanfor1 to plan almost everything—from holidays and weddings to overseas relocations. A friend of mine dedicated a Kanbanfor1 board to her goal of running the New York marathon, tracking everything from her training to entering the event and organising the trip. My partner and I will temporarily share a Kanbanfor1 board to plan what we want to do during the weekend: It usually contains things like grocery shopping, invoicing, booking flights, mowing the lawn and writing a blog post. We also plan our trips with Kanbanfor1. Even the kid uses Kanbanfor1 to manage her homework and chores (it worked wonderfully as long as we resisted the temptation to add tasks to her board!). I’d read that I should use an expedite lane on my Kanban board—and in the beginning, I did. I soon found that this isn’t necessary with Kanbanfor1, as personal tasks are usually small and it’s easy enough to reshuffle what’s up next. I quickly repurposed the expedite section of my board to a “Notes” section that I found useful for reminders. I have since seen people using the notes section as an area for reminders and to build habits. One of my colleagues has a big sticky-note with the words “Be on time for meetings” and I currently have one with the words “Random acts of appraisal” (I want to get into the habit of letting people know when I think they have done something great). You could also use it as a place for reminders of regular, date-driven tasks such as monthly reports. You can store the sticky-note tasks in the Notes field, and then move them into the flow when it’s time to do them. If you’d like to have your very own and beautifully designed Kanbanfor1 board, grab one from our shop.